The Portland & Western’s freight heading west on Water Avenue on Saturday night. From time to time I’ve wondered about the speed that the Portland & Western’s freight trains maintain on the line down the middle of Albany’s Water Avenue. Now, based on some fortuitous data gathering, I have a pretty good idea. It so happened that at dusk on Saturday night, after the heat of the day had gone down, the bike and I neared the end of a little ride through town. 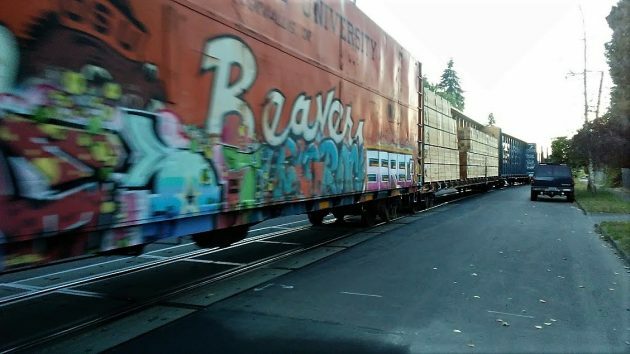 In the Willamette Neighborhood, we and a PNWR freight hit Water Avenue at just about the same time. More or less, the bike and I matched the speed of the train. And as you can see in the video below, the computer on the handlebar told me that we were both going between 10 and 12 miles an hour. The train’s speed was steady, closer to 10 mph, and mine varied a bit. You may hear me saying this was an empty train, but this applied only to the cars in front. When I stopped and let the tail end go by me, I saw cars loaded with lumber too. What about the obnoxious train tracks at Queen Avenue. Ridiculous! Between the train switching from track to track, during the busiest parts of the day, and then when the cars are allowed to go, the absolute jarring of the bones ride from the horrible tracks. Why can’t this be fixed? The problem at Queen will be fixed when the city builds an overpass or closes the crossing. Thank goodness the residents of Edge Water are protected by a guarded crossing. I love the train. Great Video! The POV perspective is fun. I may watch it one more time. Thanks HH! OE Eugene Hauler southbound before 9PM? This is either a very rare catch or else the PNWR changed their schedule again. Trains have gone 10MPH on Water Ave. for as long as I can remember. Too bad passenger trains no longer run down 5th Ave. But at least we have street running on the old OE freight route down Water Ave. It runs earlier on the weekends. I live a block away on Front Ave NE in Edgewater Village. It was so novel and fun especially when we first moved here. The grandkids and I would all go running outside to watch “our train” go by on the weekends. My husband and I are train lovers, so the noise has not been a problem. If we’re asleep it doesn’t wake us up. It runs twice each week night: westbound around 11:00 and eastbound later on. Thanks for clocking the speed for us, Hasso Hering!